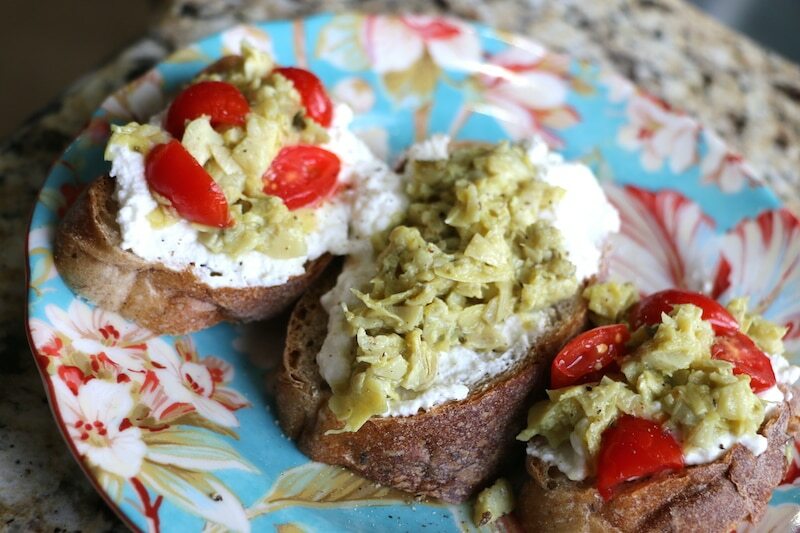 This artichoke bruschetta recipe is really simple to make. I decided to create this appetizer based on what I had in the kitchen. We joined an online farmer’s market service a few weeks ago and someone told me to buy the ricotta. I made pasta one night and still had more than half the container left the next day. I thought about different ways we could enjoy this fresh cheese and decided that bruschetta was the way to go! Artichokes are always a win for me. Small bites are always a win for me. Bruschetta is literally always the answer. It doesn’t get easier and tastier than this. Fresh ingredients = simple assembly = amazing food. This “recipe” is really layering instructions. Start with fresh bread and put a tablespoon (or more) of ricotta cheese. Apply an ample amount of diced artichokes (these were from the jar — soaked in olive oil not water) and chopped tomatoes. Sprinkle with salt and pepper. Serve. Enjoy. Yum. I told you that this artichoke bruschetta was going to be a breeze!! We ate this as part of our dinner spread, but you can also enjoy this dish as a delicious appetizer.